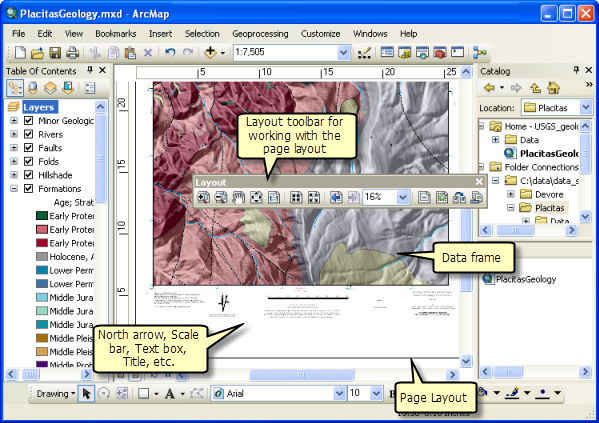 ArcMap provides two ways to view a map: data view and layout view. Each view allows you to view and interact with the map, but in different ways. Data view provides a geographic window for exploring, displaying, and querying the data on your map. You work in real-world coordinates and measurements in data view. In layout view, you work with the map layout elements, such as titles, north arrows, and scale bars, along with the data frame, all of which are arranged on a page. In layout view, you work primarily in page space (typically, inches or centimeters) except when you are interacting with a data frame in your layout. 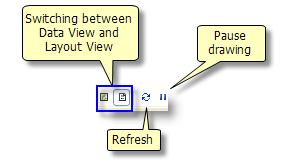 Use the buttons at the bottom left of the ArcMap window to switch between data view and layout view . You can also use this menu to refresh your map display and to pause drawing. 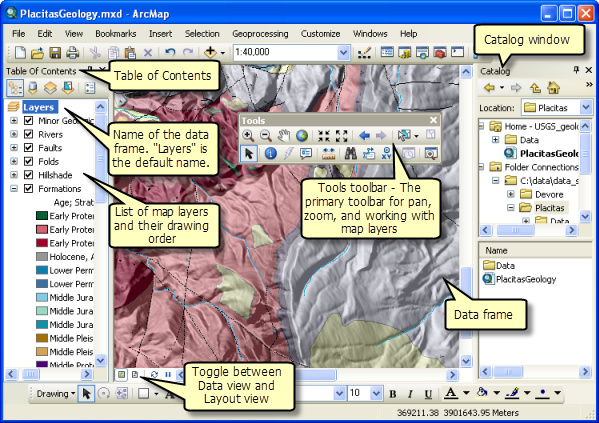 An alternative way to switch your display is to click View > Data View or View > Layout View from the main menu in ArcMap. You can toggle the display of scroll bars in data view and layout view by clicking View > Scroll Bars. This setting is independent in each view, so to hide scroll bars in both views, you'll need to change the setting in both places. The Tools toolbar is one of the primary ways that you interact with geographic information displayed in the data frame. It contains tools for working with the contents within the active data frame, for example, to pan and zoom your map, to identify features, and to measure distances. Allows you to zoom in to a geographic window by clicking a point or dragging a box. Allows you to zoom out from a geographic window by clicking a point or dragging a box. Allows you to pan the data frame. Allows you to zoom to the full extent of your map. Allows you to zoom in on the center of your data frame. Allows you to zoom out on the center of your data frame. Allows you to go back to the previous extent. Allows you to go forward to the next extent. Allows you to select features graphically, by clicking or dragging a box around them. You can also use the Select By Polygon, Lasso, Circle, and Line tools to select features using graphics drawn to the screen. Unselects all the currently selected features in the active data frame. Allows you to select, resize, and move text, graphics, and other objects placed on the map. Identifies the geographic feature or place on which you click. Triggers HTML pop-up windows from features. Measures distances and areas on your map. Finds features in the map. Allows you to calculate point-to-point routes and driving directions. Allows you to type an x,y location and navigate to it. Opens a time slider window for working with time-aware layers and tables. Allows you to create a new viewer window by dragging a rectangle. You can also use the mouse and keyboard, as well as other shortcuts, for data view navigation. For example, you can use the thumbwheel to zoom in and out on your map. For more information, see Quick ways to navigate data frames and layouts. If any of the navigation tools on the Standard toolbar are unavailable, the data frame may be set to either a fixed extent or fixed scale. To enable the navigation tools, click View > Data Frame Properties to open the Data Frame Properties dialog box, then click the Data Frame tab and choose Automatic from the Extent list. If your layer doesn't draw when you zoom in or out, it probably has a visible scale range set that prevents it from being displayed on the map at certain scales. You can clear the scale range by right-clicking the layer in the table of contents and clicking Visible Scale Range > Clear Scale Range. When you are working with a page layout, you are working in page units (for example, inches or centimeters). The Layout toolbar provides navigation tools for working in layout view. Allows you to zoom in on your layout by clicking a point or dragging a box. Allows you to zoom out on your layout by clicking a point or dragging a box. Allows you to pan the layout. Allows you to zoom to full layout extent. Allows you to zoom to 1:1 page scale. Allows you to zoom in on the center of your layout. Allows you to zoom out from the center of your layout. Allows you to set the page size using a percentage. You can also use the mouse and keyboard as well, as other shortcuts for layout navigation, using the same shortcuts and quick keys as in data view. For more information, see Quick ways to navigate data frames and layouts.